Silvarum Matrona,e domina Diana es! Hard C as in cat. K as in king. A firebrand or torch. In some translations, an ulcer, wound or opening. Heat, light, enlightenment. Possibly mistaken: burning. an opening, ulcer or injury and thus mental anguish. Kauno’s main significance is related to fire, light, warmth, enlightenment and knowledge. It sheds light on the path, dispels the dark shadows of ignorance, and helps us to see with true discernment. It suggests that understanding must lead to action, and light in the darkness implies spiritual illumination. Kauno also represents the natural warmth and companionship of the home fire and thus, good health. In its rather suspect “ulcer” translation it can represent a doorway or portal leading from darkness to light. It could also be taken as a warning to beware sources of heat or light, or of physical danger. So, if you are using this interpretation, take care against accidents, treat any illness or infirmity, and resolve your mental dilemmas. You are coming into a new understanding of life and its meaning. New insights await, but dont be complacent. Use this new understanding or it will be worthless. Look for ways to use your insights for the good of yourself and others. Enlightenment is replenishable. The more you use, the more knowledge you gain. Enlightenment itself is not the goal, it is just the starting point of a great adventure that will show you great wisdom and understanding if you proceed with truth and honesty. Cold, darkness, lack of knowledge or insight. For the wound-ulcer interpretation: healing, improvement in health. Beware hidden danger. What appears to be the true path may be a false trail. Something dark or cold may conceal great energy. For the wound-ulcer interpretation: treat a minor medical condition before it worsens. Many experts associate Kauno with the Chariot. This works on some levels, but for me the the energies just don’t mesh well enough. I feel Kauno fits better with some other cards, such as The High Priestess, The Sun, and the Hermit. I am sure there are others for which I could make just as strong a case as for the Chariot. My personal favorite for Kauno is The High Priestess. Her energy is all about shining a light in the shadows, exploring the unconscious and bringing it to consciousness. She stands for insight, understanding, discernment and spiritual enlightenment. She is the guardian of the veil between light and darkness, the conscious and the unconscious. For me, the feminine energy of both the rune and the High Priestess fit. 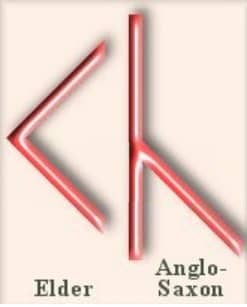 Introduzione alle Rune: Cosa sono le rune? Templum DianaeSilvarum Matrona,e domina Diana es!